There are a lot of human food items that can be safely given to dogs. Peanut butter is definitely one of them. Dogs seem to love them too and thus they make awesome snacks, in-between meals. However, not all peanut butter is made using the same ingredients. Some contain added oils while others may hide artificial sweeteners and sugar. In fact, some store-bought peanut butter products can potentially kill your dog. These products contain an ingredient called xylitol. While xylitol is perfectly safe for humans, this artificial sweetener is highly toxic to dogs. This is why it’s never a good idea to just give your dog a spoonful without checking the label. In fact, you should practice caution before introducing any new food to your dog. Mainly because some seemingly harmless human foods such as garlic and chocolate are actually highly toxic to dogs. There is plenty of available pet health advice online, so be sure to do your research. Without further ado, following are 5 things you need to ensure before you give your dog peanut butter. Never Give Them Crunchy Peanut Butter: Dogs don’t chew very well. When having peanut butter, they usually lick and swallow. Now, if the peanut butter contains bits and pieces of nuts, these become potential choking hazards. So, if you are giving your dog peanut butter, it’s strongly recommended to go for the creamy variety. Select Natural Unsweetened Peanut Butter: Peanut is naturally a bit sweet. You really don’t want the peanut butter to contain any kind of sugar. Sugar is not a very healthy ingredient for both dogs and humans. Therefore, any peanut butter product that contains sugar should be immediately rejected. If you are browsing the store for peanut butter for dogs, try and find an organic unsweetened variety. Watch Out For Xylitol and Other Artificial Sweeteners: As mentioned before, xylitol is highly toxic to dogs. The problem is xylitol is often labeled as “natural sweetener”, which is technically correct. Check the ingredients list and pick peanut butter products that contain no artificial or natural sweeteners or flavors. You really don’t want anything other than 100% peanut butter for your dog. Consider Giving them Homemade Peanut Butter: Peanut butter is pretty easy to make at home. You need a grinder and roasted peanuts. To make things easier buy pre-roasted peanuts from the store. Add the peanut to the mixer and grind it till it becomes a paste. This way you know for sure the peanut butter you are feeding your dog is 100% safe. Avoid Giving Too Much Peanut Butter: While it’s good as a snack, peanut butter should not be a meal replacement. Therefore, if you are contemplating setting out a bowlful of peanut butter, then we would strongly advise against it. 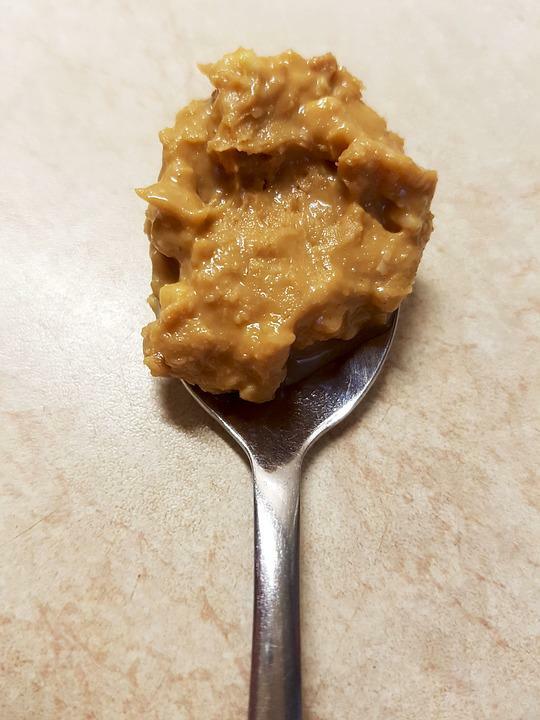 If you have a small dog like a pug or chihuahua, half a tablespoon of peanut butter is good for a day. A large dog can be given a heaped tablespoon of peanut per day.